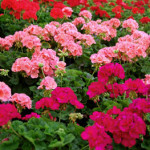 Geraniums are hardy, easy-to-care-for beauties are great as indoor plants in winter and add bright color to flower beds and “color pots” from spring through fall. Give them the best light possible. Leave some space between the pots to give them breathing room. Make sure their soil-mix is well-drained, and don’t let them stand in water-filled saucers that can rob the roots of much-needed oxygen. Water when the top inch of soil in the pot is dry. If in doubt, lift the pot—if it seems light weight, the soil is dry and they probably need watering. Fertilize with any standard balanced water-soluble houseplant bloom fertilizer 20-20-20 or 15-30-15, as recommended on the package. Remove spent flower stalks to keep the plants healthy and blooming. 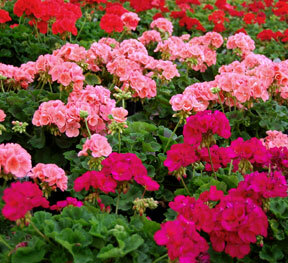 The geraniums that spend the warm months outdoors can be brought inside to enjoy as houseplants. Their cheerful, bright colors give a touch of summer even when it’s cold and snowy.